1.Safe, two-hand twin button operation. Both operating buttons must be pressed simultaneously for the stroke to be activated. 2.it is good for die cutting single or several layers material . 3.The inertial energy of flying wheel is used so that the energy consumption is low and the operation stable. 4. The whole machine uses self-lubricating system to reduce wear and extend the service life of the machine. 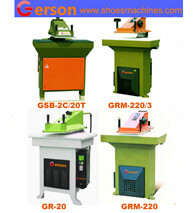 5.The cutting force and cutting area can be custom build according to the requirement.